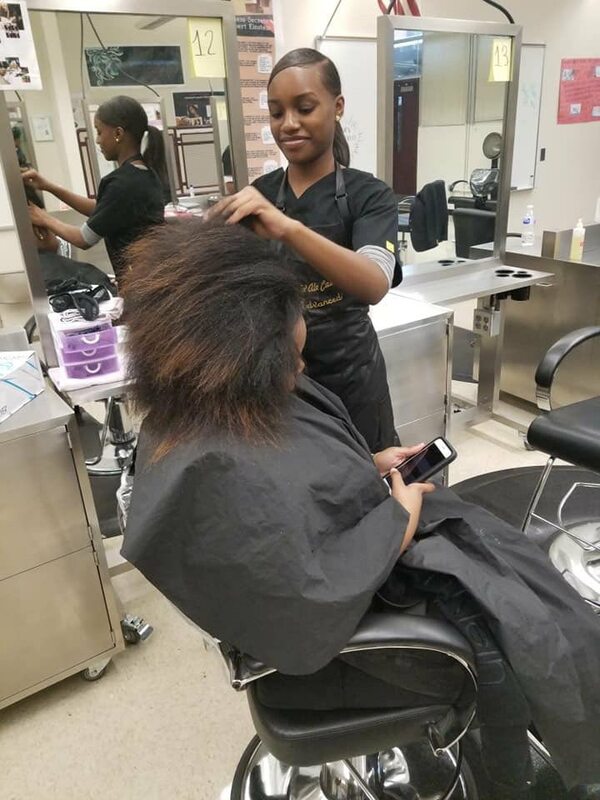 Students at West Charlotte High School are getting a jump start into careers in cosmetology thanks to the on-campus salon Infinity Style Academy. This vocational track has been at West Charlotte High School for over 30 years. The current program is headed by cosmetology teacher Deborah Ayers. She divides her time between teaching high school students the basics of cosmetology and working in a salon. Ayers said the program is providing a career readiness track for students. “So many people have to search around for careers. But, they [students] have an opportunity to have a career that they can take care of their family on by 18 and 19 years old,” said Ayers. The cosmetology program is split into two levels. Cosmetology 1 is for high school juniors. They learn the basics of cosmetology by working on manikins. Cosmetology 2 is for high school seniors. They continue building on what was learned the previous year and are allowed to work on live clients. “They are taught the basics of styling, roller setting, hair cutting, and color. The foundation is set for them in our program and we encourage them to continue on at Central Piedmont Community College, or the cosmetology school of their choice, to finish and ultimately become licensed cosmetologist,” explained Ayers. According to Ayers, if students take full advantage of the West Charlotte program both years, they can get up to 1000 hours toward the required 1500 hours for a cosmetology program. “We stay after school and come some Saturdays to give them opportunities to get 1000 hours,” explained Ayers. At 1000 hours, in the state of NC, students can take the theory section of the cosmetology licensing examination. Students will then only have to finish the last 500 hours at another cosmetology program to prepare for the practical section of the examination. When clients come to Infinity Styles Academy at West Charlotte, the experience is that of a full service salon. “When you walk into our facility, you do not feel like you are at school. You feel like you are in a salon.” Ayers continued, “The stations and student salon kits are current and up-to-date. It’s a very beautiful and peaceful place to come. It’s a place we can be proud of.” The salon was redone in 2015. It was completely gutted out and state-of-the-art equipment was put in. The tools the students are using from their salon kits are up-to-date too. “We handpicked those kits so they have quality tools to use,” said Ayers. With a quality facility, tools, and education, all students need now is support from the community. “The students thrive off the opportunity to grow. So, having people come in to get their hair done, be serviced, and enjoy the experiences is like you are sowing seeds into really fertile ground.” Ayers continued, “It would behoove anybody that would like to sow a seed into a young person’s life to come and allow the students to have a salon experience with them.”Beauty salon hours are: Tuesdays & Thursdays: 11:30am – 4:00pm, Fridays: 11:30am – 1pm, and the last Saturday of the month: 10:00am – 2:00pm. To set up an appointment contact Deborah Ayers at Deborahd.ayers@cms.k12.nc.us.